This is my first post on Cloudy Nights and I thought it might be the best place to ask a bit of a newbie question on polar alignment in the Southern Hemisphere. I'm looking at purchasing a Sky Watcher HEQ5 Pro mount to use in conjunction with my DSLR and telephoto lenses so I can try my hand at a bit of deep sky imaging. I've also been looking at a Sky Watcher Black Diamond ED80 refractor. My question is with regards to polar aligning in the Southern Hemisphere and how difficult it may prove to be. My current location has a magnetic declination of 0 degrees. With that in mind, does this mean that if I set my latitude and point my mount in the direction of South (according to the compass) that the Southern Celestial Pole should be relatively easy to find? I appreciate this may seem like a silly question to many so I suppose I just wanted to get an idea of how easy/difficult polar aligning might be. not easy but easy if that makes sense. I don't recommend a polar scope - too inaccurate and frustrating in the dim patch of sky you're looking at! Thank you very much for your replies, much appreciated. I might have a look at the Polemaster to give me a bit of help. Not that I'm expecting to be able to get a precise Polar alignment without a bit of trial and error but I'm planning on using all of the gear as part of a mobile setup so just wanted to gauge how it was done by others down here. I'll definitely be looking at picking up a guide scope and cam as well. With dslr + wide angle lens, you ready to go. Note: you can use a compass when there is no Crux in the sky. For longer focal length & exposure, you can use the 'drift method' to get precise polar alignment. The mantra for Southern Hemisphere is 'UP - LEFT'. for me, the polar scope that came with one of my mounts is useless, sigma octantis is just too dim. With zero magnetic declination, for quick visual sessions you should be good enough with just a compass. Greeting from Southern Cross skies, here at Capricornius latitude! I would recommend learning the south polar region and the stars in it. Once you can navigate to find sigma octanis, you will know the area like the back of your hand. Binoculars are an easy scouting tool. When you've found it, use the finder scope or your telescope with the lowest magnification to feel your way around. And luckily when you do find it, it won't really move over the entire night! Edited by Cirus, 05 July 2018 - 09:16 AM. I am 20 South, 43 West. The SCP is really down, as is Octans. I never used the polarscope. As I am nowadays mainly imaging, for no special reason I do like that: polar align first with Polemaster and refine with Sharpcap Polar align routine. After that the first star that I sync to is kind of centered in the FOV of my Canon DSLR (mount Mach1). Using reasonably short focal lengths as you are, this should be fine. Otherwise? PHD, Sharpcap, or Polemaster will get you an exact polar alignment easily. I made a foray to Australia in 1996 and I brought an SP-C8 with me. The SP mount had a built in polarscope with small circles on the reticule to indicate the 4 stars in the vicinity of Sigma Octans. I had no trouble placing these 4 stars into the reticule and I was able to achieve excellent PA right from the start - better in fact than in the Northern Hemisphere because I didn't have to fuss with finding the correct hour angle for Polaris. If your PAS has a similar PA scope, make sure the PA scope is accurately aligned to the polar shaft and you should be able to get good PA when observing from a dark location. 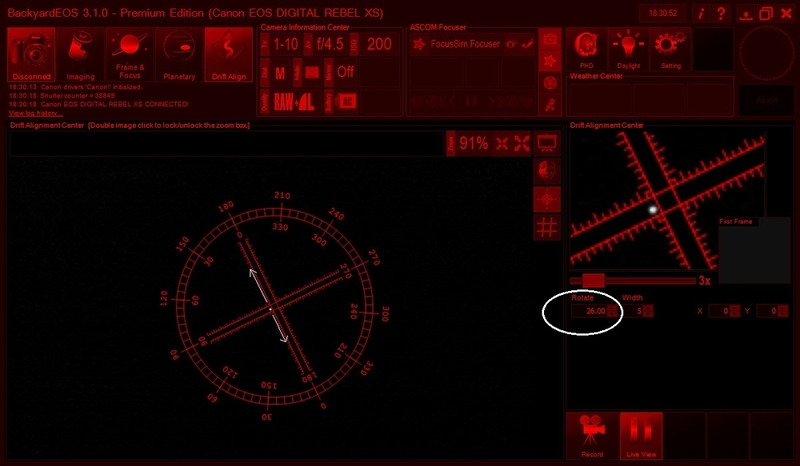 The Skywatcher reticle in the polarscope has the four stars that DuncanM refers to and once you are close enough, they do make it easier to get the last bit of alignment. The problem is getting close enough in the first place. You can do that with your camera which can see more stars than you can. Mount your camera and point it parallel to the RA axis so that it's pointing at the same point in space as the mount axis (Dec 90). Now take a shot with a moderately wide lens and use the image to star hop to the pole. Repeat as needed. Here is an old post of mine with a star hoping guide to Sigma Octans. You'll soon get to recognise the little triple star group and get Sigma Octans in the polarscope in no time, even in the city. Then there are other things as already mentioned depending on your budget, etc. I have a Polemaster but use it with SharpCap, particularly because the plate solving function helps with that initial 'get the pole region into the camera field' problem. I have tried many different things (solar noon yard stick method, drift align, DARV, PHD2 drift align, AlignMaster, PEMPro, the inbuilt routine on the mount controller), but at the end the best two options are PoleMaster and Sharpcap. However, my need is for imaging, so the polar alignment has to be fairly good. If you are just doing visual, you may be able to get away with less capable routines. I can't help you with the Southern Hemisphere angle but I've done some 35 astrophotography in the Northern Hemisphere under conditions were Polaris isn't visible. Generally its been my experience that if you set the altitude adjustment on the mount to your longitude and line up as accurately as you can with a good compass, you can fine tune your alignment by drift aligning pretty easily using the instructions you'll find quickly with a google search on that topic. Lots of people will tell you you need a fancy reticule eyepiece to polar align, but I just use the camera and do an appropriately lengthy exposure. With practice it becomes quick, you don't have to buy anything, and you really want to drift align if you're going to do astrophotography anyway. I moved to the Southern Hemisphere two years ago and had to relearn polar alignment after 20 years of experience in the north. I came across a great page on OzScopes describing various Southern Hemisphere methods, and I even experimented with the drift method to limited (but very time-consuming) success. 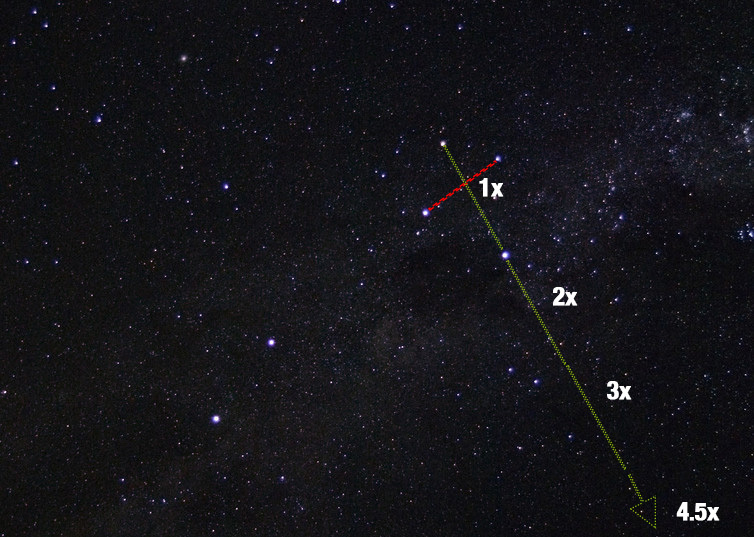 But once I got the Meade polar alignment scope with an SCP reticle, I discovered BQ Octantis—the southern pole star—which provides an excellent reference. And with a simple DSLR-only procedure, I can now get ≤2.6' (~9 pixels) of polar alignment accuracy in under 4 minutes. I recommend the Nifty Fifty for the procedure—it gives you 25˚ FOV, which makes identifying asterisms a snap. Edited by BQ Octantis, 21 July 2018 - 04:59 AM. Electric hypercar, 60 in under 2 seconds!